When you celebrate your independence in pursuit of happiness, remember those who have defended your right to use your rights. We are the Veterans Foundation of New Hampshire, Inc. d.b.a. the Veterans Law Project (VLP). As a unifying force for veterans service, our work “raises the bar” for veterans, putting Legal Boots on the Ground to bring legal assistance to NH veterans wherever they can be reached. Launched in January 2015, The Veterans Law Project has already helped hundreds of veterans with issues from child and family support, to employment, housing, health care, criminal issues, transaction disputes and beyond. Our effort targets New Hampshire’s veterans and military families, brings a dynamic impact in local communities and encourages veterans tracks within the New Hampshire Court system. Connecting over 1000 veterans to legal help. Veterans face many legal issues often complicated by their military service like Foreclosure, Divorce, Custody Battles and Criminal Charges aggravated by Post-Trauma Stress or other issues related to their war-time experiences. The Veterans Law Project recognizes that without legal guidance, many veterans needlessly suffer legal battles at home after surviving the wars abroad. 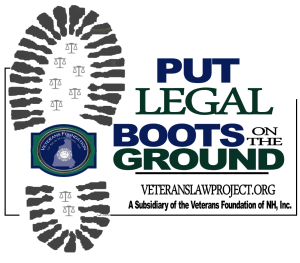 The Veterans Law Project is a subsidiary of the Veterans Foundation of New Hampshire, Inc. Located at 77 Central Street in Manchester, NH, the Veterans Law Project offers legal services and resources to veterans throughout New Hampshire, providing veteran legal professionals and an outlet of for volunteer support. The VLP provides advisory resources for local legal professionals, courts, judges and case workers to provide a better understanding of the unique needs of veterans. The VLP has assisted approximately 200 veterans in its first 4 months of operations. The majority of assistance was phone consultation where when all a veteran needs is a little clarification and understanding of their options. Other cases are referred to practicing attorneys who are willing to assist needy veterans with legal matters. Some cases are handled in house by legal staff. Our dream is to create a dynamic staff that enhances our performance and the creation of more operations to assist the needy with legal help.